With the soft feel of the warm earth toned upholstery covering the plush bustle back design and thick pillow top arms, the comfort of the Toletta Chocolate upholstery collection is matched only by the beautifully curved contemporary design along with the option of power recline on 2 seats which creates the ultimate in living room furniture. Frame constructions have been tested with various equipment to simulate the home and transportation environments to insure durability. Corners are glued, blocked and stapled. All fabrics are pre-approved for wearability and durability against AHFA standards. Cushion cores are constructed of low melt fiber wrapped over high quality foam. Features metal drop in unitized seat box for strength and durability. All metal construction to the floor for strength and durability. The reclining mechanism features infinite positions for comfort. 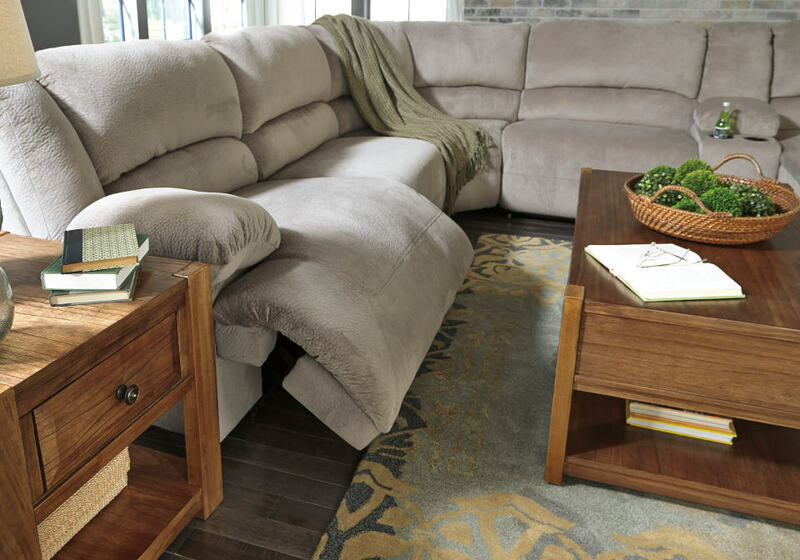 Press Back Chaise features back adjust for increased comfort. Console features storage and 2 cup holders. 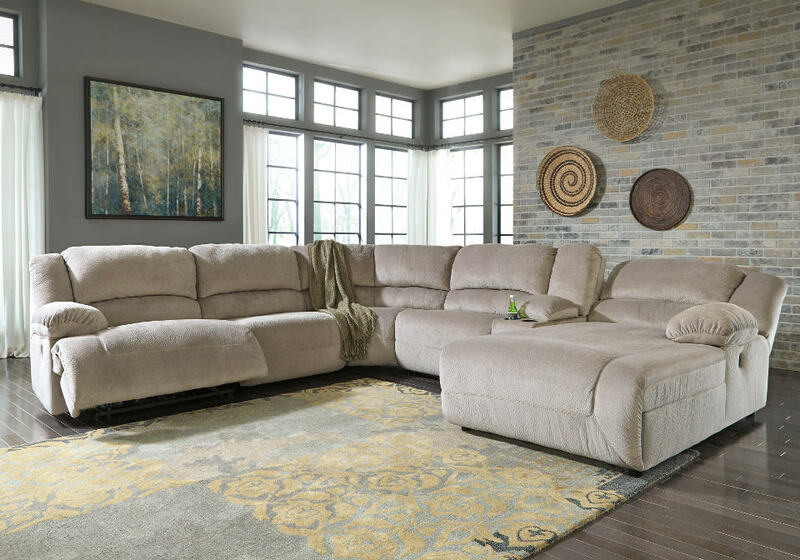 Collection features the power reclining option on chaise and LAF or RAF Zero Wall Recliner Chair. 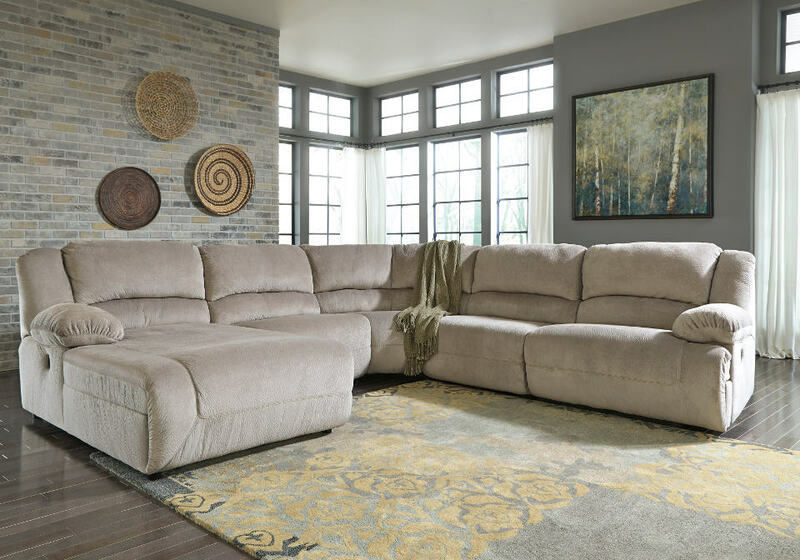 Sectional consists of, 1 RAF or LAF Pressback Chaise, 1 Armless Recliner Chair, 1 Armless Chair, 1 Console, 1 Wedge, 1 RAF or LAF Zero Wall Recliner Chair.